Great messaging can make the difference between ideas that inspire people versus ideas that fall flat. As a result, messaging is one of the most important things a marketer does. But I often hear a lot of confusion about what messaging is and how it differs from positioning and copywriting. Messaging, positioning, and copywriting are different tools marketers can use to connect with their audiences. When woven together, differentiated positioning, clear messaging, and connective copywriting can make the difference between products (or ideas) which breakthrough and those that don’t. This blog post covers how to develop a simple but powerful messaging platform. First, here are the distinctions between positioning, messaging, and copywriting. Positioning - Positioning (see post on positioning) is the market space your offering occupies in the mind of your audience. For example, when I say “safe car” what comes to mind? Probably a Volvo. That’s because Volvo owns the “safe car” position within the automobile landscape. What if I ask you to name a reliable car? You’d probably say Toyota. Or the ultimate driving machine? BMW. It would take an incredible amount of advertising dollars to convince the general public that BMW is a “safe car” or Volvo is an “ultimate driving machine” even though both could be true. Our minds categorize and anchor products in specific positions. Nailing product positioning is one of the most important things a marketer can do. The single best resource on this concept is “Positioning: The Battle for Your Mind” by Al Ries and Jack Trout. Messaging - Messaging is how you communicate your brand story and product details to your audience in a way which reinforces your positioning while resonating with your audience. Your messaging communicates across many different channels including your website, videos, ads, PR, presentations, prospecting emails, sales conversations, product packaging, and support channels. Every touch point with the customer either reinforces or detracts from your message. Copywriting - Copy is simply the words you use to convey your message. Great copywriters consider the tone of the message and the preferences of the audience. For example, does the audience expect sophisticated language or simple language? Should the tone be friendly or matter of fact? Great copywriters artfully weave together words which convey the message and personality of the brand. Okay. So how do I create great messaging? What is the differentiated position in the market you are seeking to occupy? Who is your audience? And what do they care about? What is the simplest explanation of your offering that resonates with your audience? What are the three primary benefits of your offering? Of course, you may not know all these when you first get started. That’s okay. The process of developing messaging is iterative. So you can start with a hypothesis and test it with your audience through different channels. More on that in a bit. Here is a messaging platform I have adapted over the years and find incredibly helpful when it comes to structuring your messaging. You can download a free copy of this messaging platform here. To illustrate the components of the messaging platform I’ll walk you through an example which we used at Highfive. Download a copy of this messaging framework here. Brand promise - Your brand promise is a commitment your brand makes to its audience. Don’t confuse this with a tagline. Taglines are often clever jingles that sound great in TV spots. Your brand promise doesn’t have to be clever. It has to be true. It’s a promise you make to your audience in return for their trust in your brand. Positioning statement - This is space in the market you want to occupy. The most powerful positioning is one that is highly desired by your audience yet unoccupied by competitors. 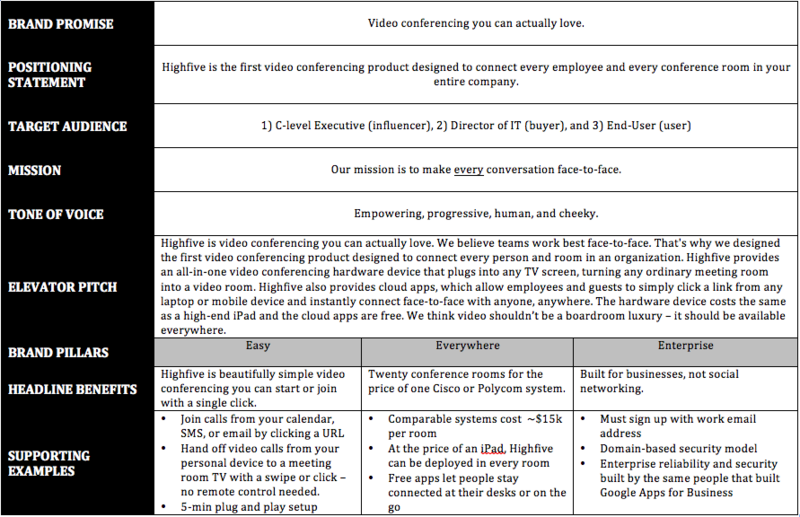 For Highfive our unique positioning in the video conferencing market was the fact that its the only video product you can put in every single conference room company-wide. That is an important benefit to IT buyers and is something that no other video conferencing product can deliver. Target audience - You’ll often have a couple different audiences. Two or three are reasonable. More than that and you run the risk of diluting your message. Tone of voice - This is helpful for the copywriters who need to add personality to your messaging. A good question to ask here is: how would your describe your brand if it were a person talking with you over coffee? Elevator pitch - Silicon Valley loves elevator pitches for good reason. Brevity is important. You need to convey your message in under sixty seconds. Remember, the goal of the elevator pitch is not to explain what your product does its for your audience to understand what your product does. There is a difference. Brand pillars - These are the primary attributes upon which your brand is built. Most people tend to list dozens of product attributes. But if you can’t articulate your three primary brand pillars you will have a very difficult time creating clear and consistent messaging. Headline benefits - These are the top benefits your audience can expect to realize from your offering. Supporting examples - Each benefit needs to have supporting evidence whether it is a product feature or customer example. Pitch it! - Put together a slide deck and then go pitch it to individuals in your target audience. Try to sell something so you get real feedback. Just asking for “feedback” will water down the feedback. Only when you ask people to commit or buy will you get real feedback. Doing this in person is always best as you want to see which slides and messages get you audience’s heads nodding. Email prospecting - Try sending emails with different subject headers and evaluate the open rates. You can also try different body messages and evaluate the response rates. Online ads - Google and Facebook are brilliant places to test one line value propositions. Take your top messages whether they are brand promises or headline benefits and put them as the text for Google AdWords or Facebook Ads. You may be surprised on which ones receive the most clicks. Once you have new insights be sure to update your messaging platform and try it all again! Was this helpful? What tips and tricks do you have when it comes to messaging?